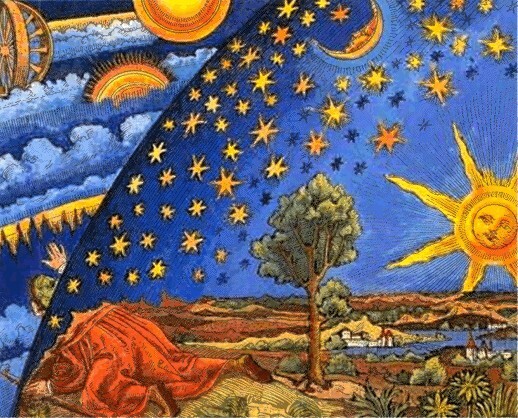 astronomy book of the french astronomer Flammarion. 1) A chemical compound known as dimethylether CH3-O-CH3 or also as ethoxyethane, CH3-CH2-O-CH;2-CHt;3. 2) A term commonly used to describe the medium of the radio. 3) Classically the element of the spirit. Below the considerations about the classical definition. A classical term for the medium of the spirit. According to the ancient Greeks was it the substance from which light emanated. In greek mythology the god Aether is the soul of the world. By vedic culture this is corroborated in the ether as being the sky which is also called akasha, the element that represents the first one of creation basic to the later ones in evolution of fire, water, earth and air. The Supreme Personality of Godhead in vedic theology may, according the bhâgavata purâna 11.5: 19 e.g., be considered the personification of the ether and as an element may it be regarded the representation of the supersoul, like with the Greeks. The Chinese, by name of the neo-confucianists, call the ether qi and consider it the basis for the generation of the creation and as that in which it also dissolves. To the way of the human virtues must according to them the troubling of the ether be cleared. In modern time, Einstein built his theory on the denial of the ether since it couldn't all that easy be proven by experiment. Thus he postulated his theory of constants, the so-called theory of relativity he himself preferred to name a 'theory of invariants'. A theory indeed, for something that is difficult to measure, might still exist; and that might thus be so with variations in the speed of light that are indicative of a fixed frame of reference like the ether. Ever since Einstein introduced his theory, have there been doubts among physicists whether the speed of light in empty space would be such an absolute constant. The ancient philosopher Herakleitos said that in principle everything is in flux (panta rhei) and the later french philosopher René Descartes stated that empty space does not exist, for according him all the cosmos is connected in force fields. Thus, looking at the stars keeping their place in the galaxy, it is difficult to deny the force field of the galaxy holding them together and possibly influencing the speed of light. Also may, as was proven by modern experiments, light travel faster, e.g. laser light under special circumstances. And so is, being serious about the evidence of the speed of light not always being constant, the stars moving around in the galaxy and the insight of possible and plausible new interpretations, of e.g. Maurizio Consoli, of the Michelson and Morely experiment to measure the ether, the existence of a fixed background by theory and experiment confirmed. That fixed background may indeed be described by the concept of the ether or the effect of the electromagnetic force field of our galaxy. In other words leads this theoretical position to the idea that the ether is our life, that the conditioning to the ether, through the cyclic of time connected with it, specifically is formative to our our spiritual as wel as our material life. We therefrom speak of the ether when we relate to that force field and experience our mind in that sphere as the 'sound in the ether ', as the classical hindu-scripture the Bhagavad Gîtâ confirms. The mind, thus seen, springs from the ether in our being identified with the cyclic of the timing of our material actions and finds at the other hand its peace again with the meditative expansion of us souls detaching on the primordial ether of spacetime. Even though Einstein on the basis of the absolute of the speed of light and his special theory of relativity is presented as being the source for the refutation of the existence of the ether as a material element, must the case be considered differently. Einstein later on in 1920 returned to the subject of the ether when he described it with according to the general theory of relativity space is endowed with physical qualities; in this sense, therefore, there exists an ether. His idea of the ether as being space with characteristics of gravity, is relativistic as opposed to that of H. Lorentz who departed more from an absolute concept of time with the ether. Einstein's insight led to the notion of the existence of different forms of ether which historically can be traced back to the three forms of Vishnu, knowing Garbo- Kâranao-and Kshirodakas'âi Vishnu (Satvata Tantra), which to themselves constitute the three representations of the ether of timespace, galactic space and the curved space of material objects as planets and stars. The first, the ether of timespace, is expansive and linear, the second, the galactic, is contracting, cyclic and creative, and is known as the 'Creator', 'Something' or the Force' and the third one, the planetary or local ether, is electromagnetically determined by the characteristics of the object in space and is also known as the radio-ether. The insight of Lorentz concerning the true time of cyclic nature with the ether is of assistance in confirming the filognostic thesis that says that when the time of the clock is equal to the true time of nature, the instability of the experience of time or psychological time then is terminated (see also the definition of Time). Thus served Einstein and Lorentz filognostically not each others refutation, but served the two rather the support of filognostically commensurate arguments. What does perish in this debate though is the notion of the constancy of light speed in a vacuum. The concept of ether as known from the classics implies a new paradigm of culture for the twenty-first century which states that, after the geocentric paradigm of Ptolemy and the heliocentric way of thinking we entertained ever since with Galileo Galilei, there is the order of life and thought as derived from the galactocentric relating to the fixed background of the forcefield of the planet and the star, the galaxy of our universe, and all the galaxies of the cosmos that together constitute the reality of the one, but divided ether, the Force so to say. It is for this reason that the Hindus speak of the mountain Meru on which the creator Brahmâ resides in the center of the universe. Ever since we photographed this mountain of stars in the middle of the galaxy heaping about the black hole in the center at Sagittarius A, is the bhâgavata purâna 5.16: 7, speaking about it as stretching upwards as far as downwards, not that allegorical anymore. Accepting the full reality of the ether, as it always was respected in spiritual and religious exercises to the cyclic of time, must, wishing such practically as a common notion of civil order and sober culture, in the meditations on the cosmic expansion of space-time with it, the ether be kept in mind as a stable time-base for e.g. a cakra-calendar, with, next to the respect for the order of the sun and the moon, e.g. birthdays celebrated in respect of the precession of the equinox, the drift of the stars in the galaxy who are every year about twenty minutes further up in the calendar, or with a special day set to the galaxy center in remembering the day when we are closest to the point of spin: a galactic new year (at 2000, O hr 6-7 July). The ether as a stable basis of time also leads to the notion of 1) a tempometer as an improvement to the standardtime clocks, and 2) a deregulation of those legal settlements of time that defy the natural order of cyclic time. Thus seen in the culture and thus furthermore also reflected in the educational system, is the concept of the ether of relevance to the personal and collective integrity of the scientific, spiritual, religious and thus also political interest of a truthful strategy of cultural maintenance and order of relating to the forces of nature, we at this site have baptized with the name filognosy: the straight love of knowledge in cultural comprehension. Ether: de nederlandse pagina hierover. The Ether Exists! Read the introductions and the synopsis together making for the book The Ether Exists!.